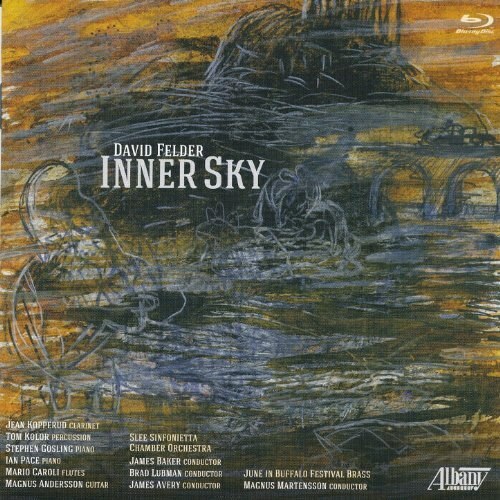 When I wrote about Felder's flute concerto Inner Sky (1994, rev. 1999) in a concert review of Tanglewood's 2011 Festival of Contemporary Music, I mentioned how much I looked forward to hearing the piece again on its (then in preparation) recording. What I didn't mention at the time: my concern that it would be difficult to capture the many details of the piece on record. Enter blu-ray audio. Indeed, David Felder's music is perfect to demonstrate the capacities of blu-ray audio. Musical climaxes feature piercingly fierce highs and rumbling lows. Elsewhere, shimmering diaphanous textures, frequently blending electronic and acoustic instruments, surround one immersively in this multi-channel environment. By the way, if one doesn't have access to blu-ray, the recording package also includes an audio CD. The Slee Sinfonietta again, this time conducted by James Avery, gets to go their own way on Dionysiacs. Featuring a flute sextet, the piece contains ominously sultry low register playing, offset by some tremendous soprano register pileups that more than once remind one of the more rambunctious moments in Ives's The Unanswered Question. What's more, the flutists get to employ auxiliary instruments such as nose whistles and ocarinas, adding to the chaotic ebullience of the work (entirely appropriate given its subject matter). Clarinetist Jean Kopperud and pianist Stephen Gosling are featured on Rare Airs, a set of miniatures interspersed between the larger pieces. These works highlight both musicians' specialization in extended techniques and Kopperud's abundant theatricality as a performer. Pianist Ian Pace contributes the solo Rocket Summer. Filled with scores of colorful clusters set against rangy angular lines and punctuated by repeated notes and widely spaced sonorous harmonies, it is a taut and energetic piece worthy of inclusion on many pianists' programs.